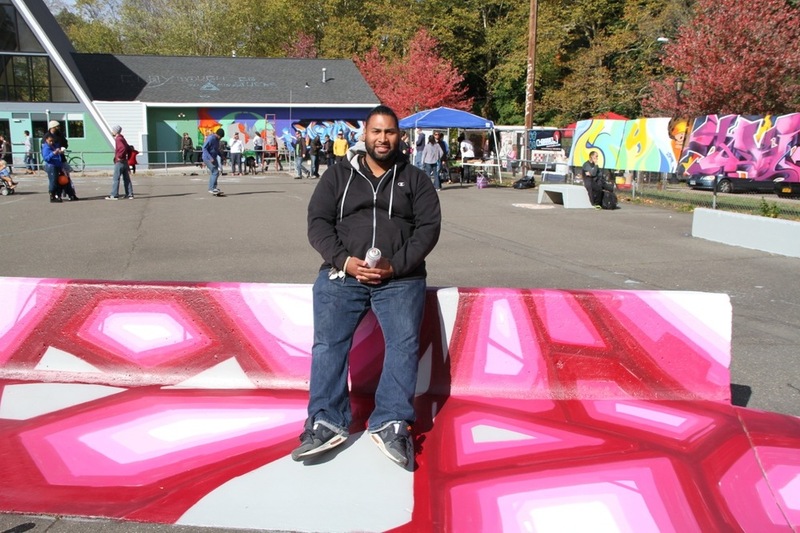 The kick-off event for SITE PROJECTS’ 2014 series Catalyze + Celebrate: Commissions + Conversations, Art in the Park transformed a 16-year old skate park adjoining the newly restored Coogan Pavilion in Edgewood Park into a massive collaborative mural and dynamic community center. Local businessman and artist Lou Cox partnered with Site Projects to curate an incredible line-up of graffiti artists led by the pioneering hip-hop artist and founding graphic designer at Def Jam Recordings Cey Adams. Throughout the weekend of October 25, 2014, internationally renowned artists and local talent convened to create a group of collaborative murals, while a series of panel discussions exploring changes in street arts’ history, influence, legacy and reception, punctuated the hiss of spray cans. Participating artists included: pioneering graffiti writers, Tkid, Part One, and Dr. Revolt; new-school talent, Queen Andrea, Muck, Chino, Alice Mizrachi, and Eric Adams; New Haven legends, HI-Crew, and Dooley-O; as well as Alberto Colon (Tenk2), Josh Griffin, Ivory, Page, Reo (HI-Crew), Eric Mikita, Jahmane West, Zeph Farmby, Ryan Cyr, and Dave Thomas. Janette Beckman—award-winning photographer of punk and hip-hop circles throughout the United States and Europe—documented this extraordinary gathering. This programming would not be possible with out our long‐standing and committed partnership with New Haven's Parks Department. We are grateful and thrilled to continue our work together with this stunning endeavor. Watch Art in the Park in the Catalyze + Celebrate: Commissions + Conversations video.